People join an ecovillage to live in community and close to nature, and later come to learn that there is disagreement about what these words mean. Angry factions develop over what kind of nature to cultivate at the village, with one group valuing food production on-site, another group wanting to cultivate native plants, and another group advocating for growing beautiful ornamental plants. There is disagreement about the meaning of community as well. Some residents hope the village will feel like a happy family with daily authentic connection. Others are busy with their nuclear families and work, and so are content to know their neighbors’ names and to lend each other items occasionally. 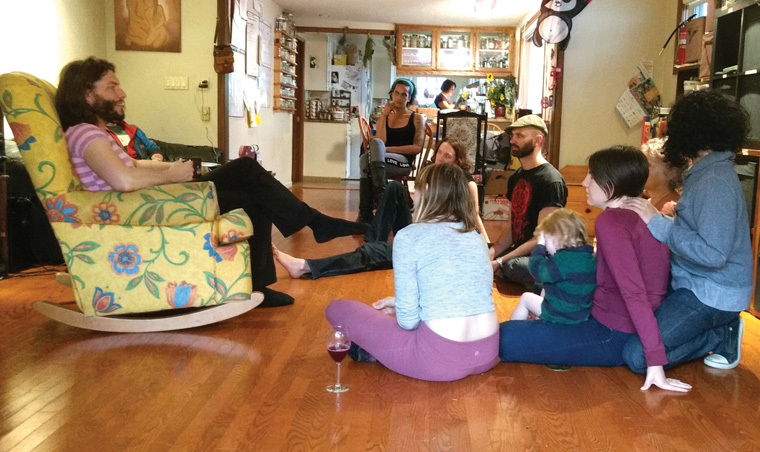 Some village members want to welcome neighbors outside the ecovillage onto the property, while others feel nervous about opening the ecovillage doors to those who don’t live there. Disappointment due to mismatched expectations abounds. Meetings are frustrating. Some people attribute the problem to one person who complains frequently in meetings on a recurring theme. A few community members were excited about starting a business that they believed would benefit themselves, the group, and the larger community. A couple of people blocked this proposal, and the three initiators decided to move away in order to have the freedom to pursue their dream. Over time, there were fewer people still living at the community with energy for bringing new projects and ideas to the community and the world. One business Laloux studied is Buurtzorg, a Dutch health care organization in which small teams of nurses care for patients in their homes. Buurtzorg was founded with one group of 10 nurses in 2006, and had grown to 7,000 nurses by 2013, representing two thirds of all neighborhood nurses in the country. Buurtzorg has decreased the number of hours each patient needs professional care by 40 percent and decreased by one third the number of emergency hospital visits of their patients compared to the traditional care offered in the Netherlands. Patient health and satisfaction with their care increased, while absenteeism of nurses due to sickness has been cut 60 percent, and turnover is 33 percent lower. What can we who live and work within intentional communities learn from this type of organization, which Laloux calls “Teal”? How might the three characteristics Laloux observed in the businesses he studied address the community scenarios described above? ● What are the best means to accomplish your chosen impact? ● What action steps will you take? If there’s not enough commonality in answering these questions within the forming or already existing community, a viable action step may be for some people to break off and start a different group. Or it may be that people deepen their appreciation for each other’s passions through participating in this process, and graciously make more room for differences of perspectives within the community. The community that argued about what kind of plants to grow could decide to divide up the property into sections, with each group caring for part of the land held in common, or they could cultivate beautiful, native, food-producing plants. ● One person speaks something that is true for them, or they may also speak what they imagine other people or entities might say on the topic. The goal is to have every possible perspective shared, even those that aren’t in the room currently. ● People place themselves physically in the room based how much they resonate with what was just said. They stand next to the speaker if they agree with what was said, and farther away if they disagree. ● Someone else expresses a different idea, and the others reposition themselves physically in relation to this speaker. This process provides an efficient way to gauge the sense of the group on controversial topics. Participants aren’t rigidly locked into their initial perspectives, as they find themselves moving close to people with different, seemingly contradictory perspectives. I have noticed that challenging issues often solve themselves after these sessions. After a worldwork session on raising children, for example, more community members engaged with the children, and parents became more consistent and clear about boundaries for their kids. Even without negotiating specific policies, safety concerns expressed in the worldwork session were addressed. What Laloux means by the expression “welcoming the whole person” is that feelings, intuitions, expressions of vulnerability, and rational thought are all invited to be expressed. A worker might let her colleagues know about extra responsibilities that have temporarily arisen at home, for example, and the coworkers might offer to cover some of her work roles so she can spend more time at home. This form of welcoming the whole person is fairly common in intentional communities, unlike traditional businesses that limit acceptable expressions to those that are rational thought, so I would add some more ideas to this category to help stretch intentional communities. The first idea is to warmly welcome people, beaming them energetic love, which will help in the scenario where someone repeats herself in meetings. Sometimes people show up in annoying ways because they want attention, and will seek negative attention when they don’t receive the affection they long for. Affection is a basic human need, and people who don’t receive enough of it tend to be anxious, which affects how they act and how people feel being around them. It’s helpful to greet all community members with enthusiasm and kindness as they enter a meeting room, especially those who don’t receive enough affection in their daily lives. The second idea I would add to “welcoming the whole person” is to validate what is true and valuable in each person’s sharing, publicly acknowledging the contributions they bring to the group. In one meeting where I was a guest facilitator, there was someone who was very concerned about whether the group was following their agreed upon procedures, and I sensed others felt impatient with her concerns. When I thanked her for letting me know what these procedures were and for the important role she played in reminding people of them, she relaxed and agreed along with everyone else to put aside their traditional process for a specific amount of time in order to explore a different way of doing things. The third additional aspect of “welcoming the whole person” I recommend is to provide support for people to consciously expand their repertoire of behavior, exploring new ways of being in the world. An example is to invite those who speak often to listen more, and for quiet folks to share more in the group. In this way, everyone experiences more of the full range of being a person. The Zegg Forum is a communication tool that encourages people to show their whole selves to their community or workplace, especially sides of themselves that others don’t usually see. ● Everyone sits in a circle. People take turns walking the inside perimeter of the circle to share what is alive for them, including their joy, sadness, anger, and/or fear. The speaker may talk about other people in the room as long as they don’t look at them while they are speaking about them. ● For the first part of the forum, people share for a maximum of two minutes each. The second part of forum is facilitated by a couple of people who might encourage the speaker to exaggerate something, to try on an opposite way of being, or to participate in a role play. ● After a few mirrors, everyone claps, and a new speaker enters the circle. This process is helpful for airing resentments that arise in daily life, and for allowing people to see each other’s personal struggles. It also offers opportunities for people to try on different ways of being in the world. One man who talked about feeling lonely accepted an invitation by the facilitators to wear a “passion man” superhero outfit with a heart attached to his chest for the next three days, while those listening were invited to offer him hugs and friendly connection. He appeared to be more socially confident and connected long after he stopped wearing the costume. It’s helpful to hold separate gatherings for the expression of feelings and decision-making because people who are comfortable expressing anger and other intense feelings can end up dominating in meetings where there are others who are less comfortable in the presence of these feelings. The folks who are not yet comfortable with the expressions of feelings tend to shut down mentally when strong feelings arise, and stop participating in the rational conversation required by effective decision-making. If the culture of the group shifts so that everyone learns to stay present in the presence of strong feelings, the two kinds of gatherings can then be combined. This third characteristic of the thriving businesses Laloux studied, self-management, provides ideas for addressing the third community scenario in which a few people want to start a business but are blocked from doing so. When implemented well, self-management brings out the best in people, including their dedication and creativity. Self-management gives more power to small, semi-autonomous teams to make decisions, and these teams give more power to individuals than I’ve typically seen in intentional communities. This decentralization of power only works well when certain conditions exist, including the presence of a clearly articulated and shared evolutionary purpose and a group that welcomes the whole person. Two other conditions required for successful self-management are the “advice process” and a culture which supports frequent and skilled feedback. I lived in an intentional community governed by the advice process 40 years ago, and loved the freedom it offered me to explore different careers and lifestyles. I started several businesses, and built a greenhouse that was attached to our house, all without a formal proposal or meeting to approve these initiatives. This approach is a radical departure from decisions based on consensus of the whole group! ● Offer something you will do, make a specific request, and then negotiate a solution. So there are five tools for implanting what Laloux calls “Teal Organizations.” I would love to hear from you about your explorations into getting more done with your groups while having more fun, as I’m in the process of creating a website with these and many more ideas. Send your experiences along to be included! Melanie Rios consults and offers presentations on effective collaboration, including Teal Organizations, sociocracy, and emergency preparation. She loves to grow food using terra preta soil which she produces at her home in Portland, Oregon. She also enjoy singing with friends and backpacking in alpine mountains. Her email address is mel [at] rios.org. *I highly recommend that you read the book, or at least watch the YouTube video about Laloux’s work: www.youtube.com/watch?v=gcS04BI2sbk.